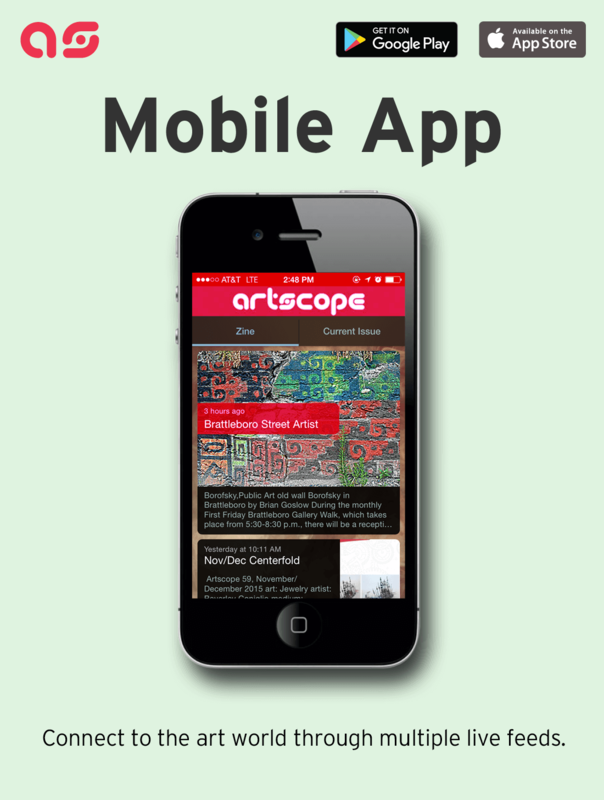 Your work can be Artscope’s next Centerfold. Work by established and emerging artists welcome. For the July/August 2017 issue we will be accepting submissions in the category of Wood medium. Send up to three images and your statement with contact information to: centerfold@artscopemagazine.com by June 15, 2017. Gallery 444. Artist Wanted for Pop Up Shows @ Gallery 444, 444 Commercial Street-Unit 2, Provincetown, MA. Contact: gallery444ptown.com. Rockland Sculpture Race. Event: August 12. Submission Deadline: June 1. Submit a design proposal for a human-powered sculptural creation to be pushed, pulled or pedaled. Awards for speed, spectacle and ingenuity. rocklandsculpturerace.org. StoveFactory Gallery Proposals for Exhibitions: StoveFactory Gallery is planning exhibitions and events for 2017. Please send proposals 6 weeks prior to requested event date to: stovefactorygallery@gmail.com, subject line: gallery proposal. ArtSpace Maynard invites artists in all media (except video) to submit proposals for one month solo or group exhibitions for the 2017-2018 season. The proposed exhibit should be based on a unifying concept that is social, historical, philosophical, cultural, political or other. The ArtSpace Gallery is one of the largest nonprofit exhibition spaces in Massachusetts. Preference will be given to New England artists. For guidelines go to: artspacemaynard.com/proposals. Deadline: May 15, 2017. Call for Artists: The Eighth Annual New England Collective Juried Exhibition at Galatea Fine Art in Boston’s SOWA Art District. August 2-27. All media. Juror: Charles Giuliano, Publisher/Editor of the Berkshire Fine Arts Journal; Critic, Writer, Teacher, Curator, Artist. Visit galateafineart.com for more information. Entry deadline: July 10, 2017. For prospectus: galateafineart.com. (617) 542-1500. Guild of Boston Artists Gallery. 2017 Regional Juried Exhibition September 5 – 27: Cash Awards. Juried show open to artists living in New England and working in the realist tradition. Deadline for entries: August 1, 2017. Visit: GuildofBostonArtists.org for prospectus & application or Apply Online! Events: Discover Quincy 50 Days of Freedom Starting with the City’s Signature Flag Day Celebration on Saturday, June 10, Discover Quincy is partnerting with many local organizations to showcase Quincy’s arts and culture, community, education, historic and recreational assets. Each day will feature at least one free event, while some events may accept donations and others may have an admission fee. Program partners include : Adams National Historical Park, Adams Crypt at United First Parish Church, Arts Affair Marina Bay, Blue Hill Adventure & Quarry Museum, Dorothy Quincy Homestead, Dragonfly Theater, Friends of the Blue Hills, Friends of the Thomas Crane Library, Friends of Wollaston Beach, Independent Artists, John Adams Health Walk, Josiah Quincy House, Quincy Art Association, Quincy Bay Race Week Association, Quincy Chamber of Commerce, Quincycles, Quincy Choral Society, Quincy Farmers Market, Quincy Historical Society, Quincy Militia, Quincy Symphony Orchestra, South Shore School of Theater, USS Salem, and more. To view the schedule visit discoverquincy.com.